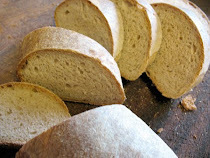 Have you ever had a time when you wanted fresh hot yeast bread but time was short? Perhaps you had made soup or stew for supper and realized that some bread would be the perfect thing to go with it. Or one morning you were planning to have sandwiches at lunchtime in a few hours but discovered you were out of sandwich bread. 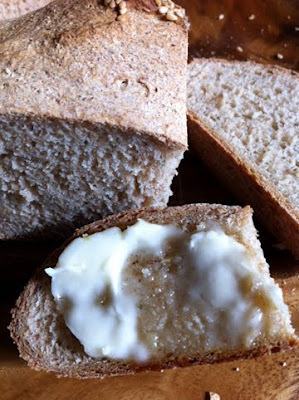 Usually it takes 4-5 hours to make a loaf or two of yeast bread from scratch. What to do, what to do? Try this delightful Cuban Bread from Bernard Clayton's New Complete Book of Breads. It only takes two hours or a bit more. The clever Bread Baking Babes are gathered around the kitchen table of Ilva of Lucullian Delights this month and she discovered this tasty bread and challenged us to bake it. 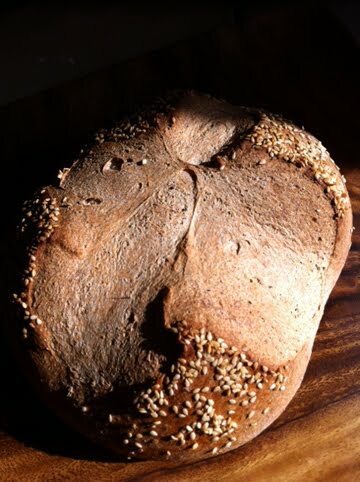 Now to give a serious bread baker a recipe like this is a bit dangerous because I love to bake bread and now I know I can make this one almost on a whim. This is not a No-Knead bread but you can let a food processor or mixer do most of the kneading if you like. It does used a healthy dose of active dry yeast to speed things up but doesn't taste too yeasty. 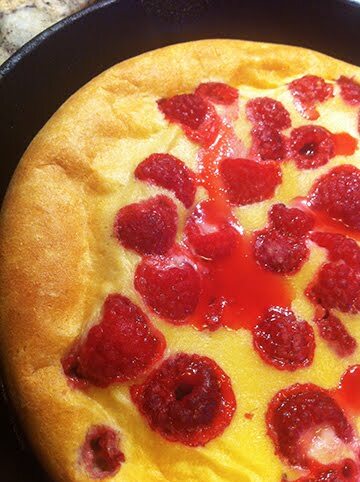 It has a nice crumb and crust and uses an unusual process where you start baking it in a cold oven! I used sesame seeds on top and put a teaspoon of herbs de Provence in the dry ingredients because I love herby bread. 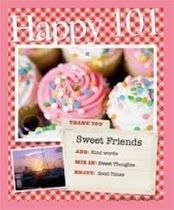 Hope you will be a Buddy this month and give this one a try. It's quick and easy and you get lovely warm fragrant bread to eat when the two hours are up. To be a Buddy just bake the bread, take a photo and send an e-mail to Ilva with a brief description of how the baking went for you and that photo. 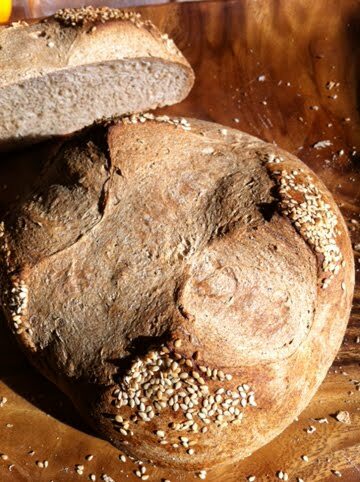 Just the photo isn't really enough because we love to know if you enjoyed the bread, if you found the process interesting or difficult or easy and so on. 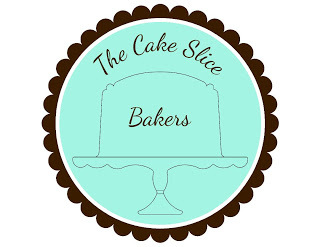 Ilva says, "If you do the Buddie, please bake and send me the link to your blog post about it before midnight Saturday 28th of January to luculliandelights AT gmail DOT com, please write Bread Baking Buddy a the subject so that I don't miss it!" While you are thinking about this wonderful bread, do check out the loaves made by my fellow Babes. The list with links is to the right. 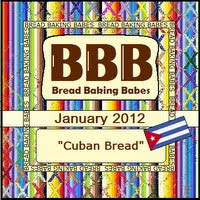 Thank you (I think) Ilva for asking us to bake Cuban Bread as our first challenge for 2012! Place 4 cups flour in a mixing bowl and add the yeast, salt and sugar. Stir until they are well blended. Pour in the hot water and beat with 100 strong strokes, or three minutes with a mixer flat beater. Gradually work in the remaining flour (using fingers if necessary), 1/2 cup at a time until the dough takes shape and is no longer sticky. Sprinkle the work surface with flour. Work in the flour as you knead, keeping a dusting of it between the dough and the work surface. Knead for 8 minutes by hand or with a dough hook until the dough is smooth, elastic, and feels alive under your hands. Attach the short plastic blade. Place 2 cups flour in the work bowl and add the other ingredients, as above. Pulse several times to thoroughly mix. Remove the cover and add 2 more cups of flour. Replace the cover and pulse to blend. Add the remaining flour through the feed tube, pulsing after each addition, until the dough begins to form and is carried around the bowl by the force of the blade. Turn on the machine to knead for 45 seconds. Place the dough in a greased bowl, cover with plastic wrap, and put in a warm (26-37°C/80-100°F) place until double in bulk, about 15 minutes. Yummy looking bread Elle! Lovely nutty color on the crust! Your loaves look so nice and rustic, not at all like mine! Delighted you added the herbs: I came so close to dashing into the garden and using a little rosemary but didn't. I'm not too worried about not having done that because I figure I'm bound to bake this one several times very soon. A dangerous recipe to give a serious bread baker indeed I'd say any bread baker. Truly a beautiful loaf on your table. Really love the way your sesame seeds look so exploded on the board. 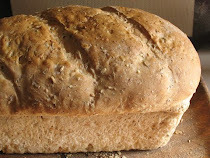 Elle your bread looks fantastic, maybe I must make some more today... and I really like the idea of adding herbs to it! The bread looks great - what a wonderful idea to add herbs! I'll try that next time. Lovely idea to add some dried herbs, that makes it smell (and taste) even better! Loave that deep slash/ovenrise. That looks delicious - I'll have mine slathered in butter, please. Babes, This one is a winner. Next month's sounds even better, so hold on to your hats!